The Vinegar Tart first encountered Oliebollen in November in Amsterdam (see previous post Sugar, Grease and Alcohol published November 22) so it is only fitting that we see the year out enjoying Oliebollen. 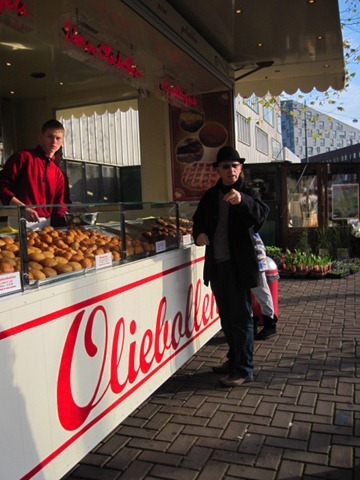 Nothing quite says “Happy New Year” like a big ol’ greasy oliebollen or “oil ball”. 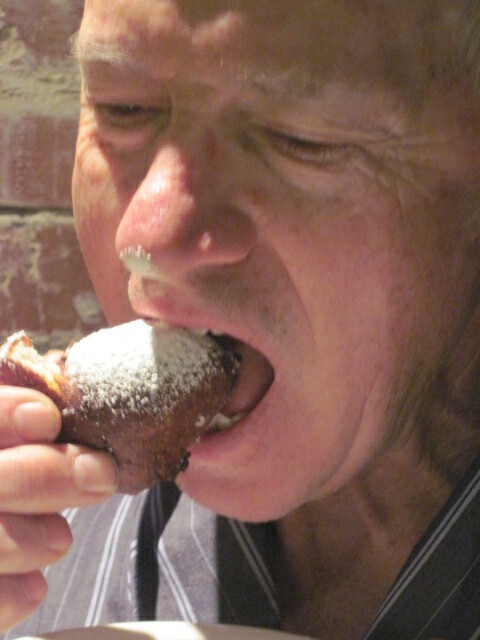 There is nothing quite so satisfying as burying your grand proboscis in a warm, sugar covered Oliebollen. With a little planning, you can have the dough made up (it does have to double in volume); your hair coiffed, make up applied; glad rags pressed and dressed with the deep-fryer bubblin’ hot ready for action prior to midnight. Don’t forget the apron. I know from experience the more expensive the ensemble the more attractive it is to grease. 1. In a large bowl or mixer bowl measure 2 cups of flour. Add the dry ingredients. Stir in hot water. 2. In a small bowl beat the eggs and vanilla; pour into flour mixture. 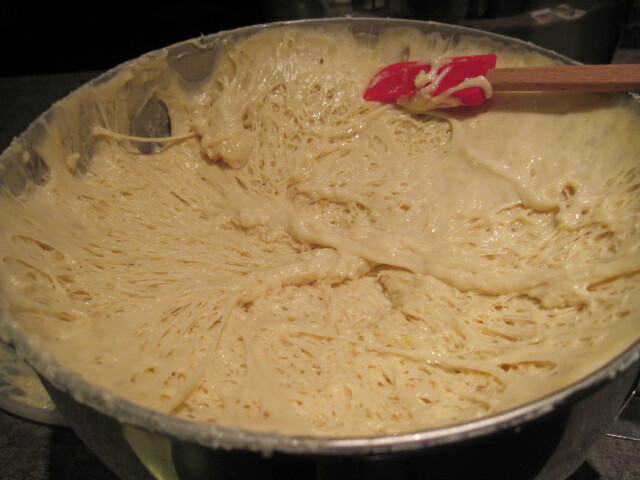 The batter will not absorb the eggs immediately but keep working until it does. 3. Gradually add more flour to make a heavy batter. Add lemon peel. 4. Cover the bowl with plastic wrap and let rise until double in volume – one or two hours. The dough can also be put in the fridge to double in volume over night. 5. If using a deep fryer, add oil to required depth for your fryer and heat to 375 degrees. If using a deep skillet, add oil and heat until a test drop of batter browns nicely. 6. Don’t make your fritters too big as they will not cook inside. 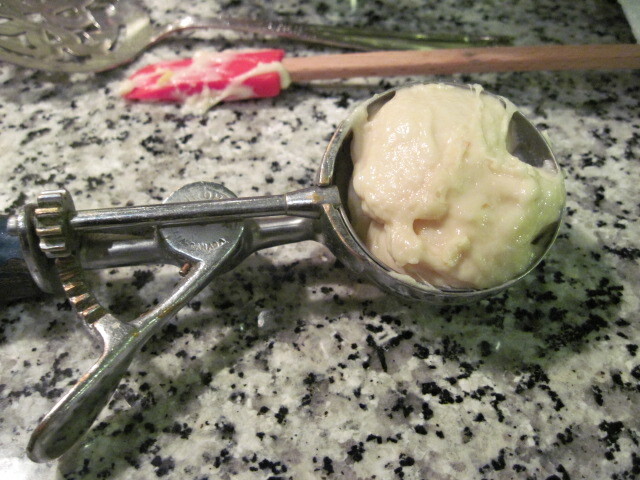 I am using about 1 tablespoon of batter dropped from a disher style ice-cream scoop (it has a mechanical device for removing the ice-cream or batter). Drop batter into hot oil. Do not drop too many Oliebollen in the oil at once or they will not cook quickly enough and will take on oil resulting in heavy, leaden Oliebollen. 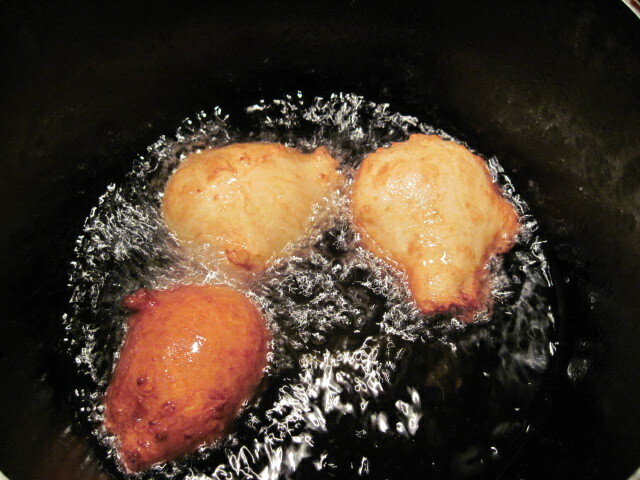 Cook until fritters are puffed and both sides are golden brown – about 3 minutes. Remove with a slotted spoon and drain on paper towels. Sprinkle with a snow fall of powdered sugar. Take a bite…sip some Champagne. Enjoy. Eet Smakelijk – which means, in Dutch, “Eat well and with taste.” And, if it doesn’t mean that exactly, well, please don’t pour acid rain on my parade. Happy New Year. Thank you for following. 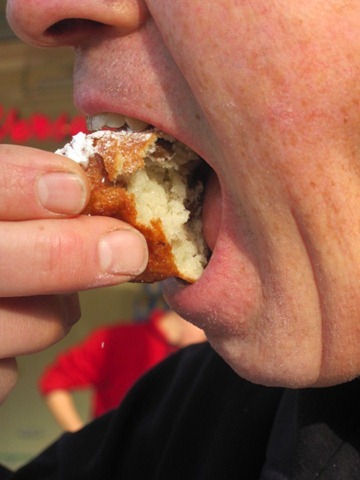 Oliebollen - not just for breakfast! Howdy Kin! I concur with the grease:fancy outfit correlation! 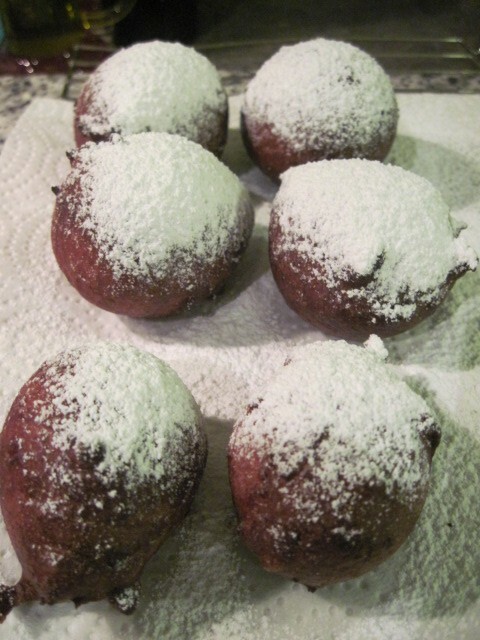 Although we will likely not be attempting this deep fried recipe, we shant be deterred from enjoying other fattening foods over this New Year’s Weekend! Wishing you both a happy and prosperous 2011!